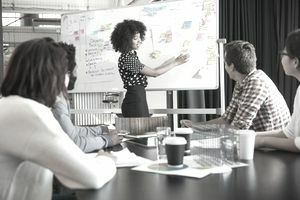 The field of project management offers a variety of tools and techniques designed to simplify and help control the work of doing something new. By definition, projects are all of the work we do once—they are temporary and unique activities—in contrast to the many daily operations activities in a business. The discipline of critical path project management (CPM) was established in the late 1950’s and remains widely practiced today. This article offers an overview of how the critical path approach is used to help teams complete their project initiatives. The critical path by definition is the longest sequence of events in a project plan. They are the events that must be completed without delay or the project risks running longer than the planned duration. Another view of the critical path suggests that it is the sequence of events with the smallest amount of slack (extended time). This technical terminology is easier to understand by describing the process of identifying the critical path for a sample project. Drawing upon the example of constructing a house, the steps below define the process for identifying and using the critical path. Whenever a group is assembled to work on a project initiative, there’s excitement and energy to move forward quickly with the work. However, a disciplined project manager understands how important the planning phase is to the ultimate success of the initiative. The work of identifying the critical path starts with clarifying the scope of the project and determining the most important outputs or features. Imagine you are building a house. Before initiating any actual work on the house, it is important for you to scope the project and describe the key features. In this example, let’s assume your scope calls for a 2,000 square foot home with three bedrooms, a living room, dining room, kitchen, three bathrooms, and an unfinished basement at a cost not to exceed $200,000. While the specifications offer a good starting point on the scope, you still have to define the construction materials—wood or brick—and identify other key features including heating, air-conditioning, and others. Last and not least, you need a target for the completion of this house. The project manager using the critical path method will work with her team to translate the scope and key features into a listing of all of the work that must be completed to create the project. A tool used for identifying the work tasks is the work breakdown structure. The project manager works with the extended team to brainstorm on all of the tasks needed to produce the home complete with the key features we described in our scoping activities. A simple technique of jotting each key task down on a sticky note often results in walls covered with the output of this brainstorming. The process ignores the sequence of events and the availability of resources and focuses exclusively on identifying tasks. Once the group has confirmed that all of the work necessary to deliver the project has been identified, they create time and cost estimates for each discrete activity and then turn their attention to identifying the critical path. Armed with the contents of the work breakdown structure, including the time estimates for each of the work items (also called work packages), the team members focus on defining the sequence of events necessary to complete the project. They use the key features or deliverables identified in the scope materials as a starting point and build out the different project paths. In our example of constructing a house, we would logically sequence of digging and pouring the foundation and framing the house before adding the roof. Our challenge is to find the right sequence of events that enable the project to proceed smoothly without significant downtime. What emerges after this sequencing activity is a project network diagram complete with different paths. Using the duration estimates, the project manager typically relying on project management software calculates the earliest and latest time each activity can start and finish. The process identifies those items in the sequence that have extra time (float or slack) and those items that absolutely cannot be delayed without delaying the entire project. The path that defines the longest duration or least amount of slack through the network is the critical path. And while technically there can be multiple critical paths in a project network, most project managers and teams work on adjusting the sequence of events to minimize this possibility. Armed with clarity on those items that must be completed on time or the project risks delay, the project manager focuses considerable time and attention on monitoring and controlling these activities. If an item on the critical path will potentially run late, the project manager might allocate additional resources to accelerate completion. If there is a resource conflict between two activities on the critical path, the project manager will resolve this in a way to minimize any delays. Understanding the critical path dramatically simplifies the process of scheduling resources. The project team can focus on ensuring the availability of the right resources at the right time. As described below, if necessary, resources can be borrowed from non-critical activities to help keep the time-sensitive tasks on track. While items not on the critical path are ultimately essential to the project’s completion, by definition they have extra time or slack and their delay is unlikely to delay the target finish date of the initiative. To compensate for potential critical path delays, project managers frequently borrow resources from non-critical items, taking advantage of the flexibility of slack for those items. The critical path project technique offers the project manager a set of tools critical to managing risk and optimizing the chances of completing projects on time. The background planning time is considerable with this method, yet the benefits for control and coordination are priceless.